Join The Human Family in Moorhead, Minnesota at the Moorhead Public Library – Lake Agassiz Regional Library on Thursday, March 14th for a screening of “Home. The Homelessness Crisis in North Dakota”. Focusing on the homelessness crisis in North Dakota, the series examines the myths, the individuals impacted, the causes and the state-wide community response to the epidemic. 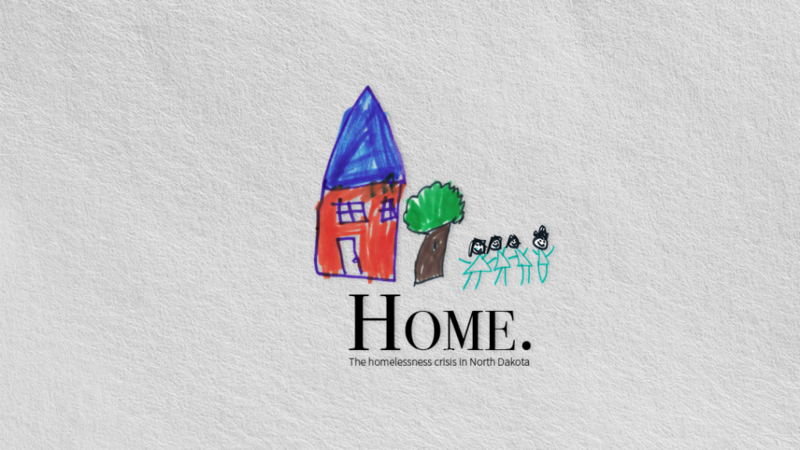 “Home.” is a documentary limited-series and will have multiple episodes released in 2019 with the goal of increasing community involvement in preventing and eliminating long term homelessness throughout the state. The series will be aired on local television stations and will be made available for viewing online free-of-charge. 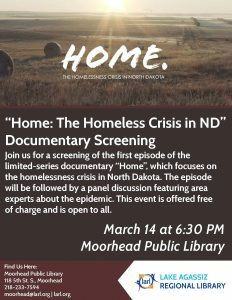 The screening will be followed by a panel discussion featuring the following area experts about the epidemic: Naomi and JR, residents of the Fargo-Moorhead area who formally experienced homelessness; Angela Daly, Shelter Services Director at the YWCA Cass Clay; and Alexa Dixon, Homeless Outreach for Lakes and Prairies Community Action. Sonya Jensen, Director of “Home”, will moderate the discussion. The event is free and open to the public. Limited seating is available, so reserve your seat online. The screening begins at 6:30 p.m.